Six boats competed in the fourth Robie Pierce Women’s Invitational Regatta on May 29, and 19 in the sixth Robie Pierce One-Design Regatta May 30 – June 1 at Larchmont Yacht Club in Larchmont, NY. Over 45 sailors with disabilities representing 19 states and Canadian provinces participated in the two regattas, which were hosted in conjunction with American Yacht Club in Rye, NY. 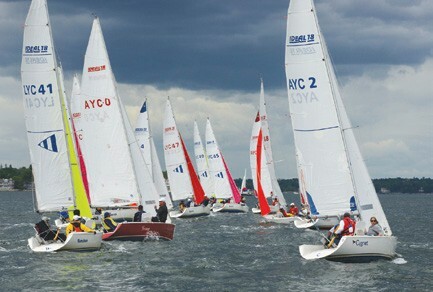 Both regattas were sailed in specially adapted Ideal 18s owned by the host clubs. Race Committee PRO Cynthia Parthemos faced challenging conditions all weekend with winds from 0 to 26 knots greeting the sailors, but managed to provide excellent racing. The Robie Women’s Invitational Regatta was held in 8-14 knots, and four very competitive races were run. When the smoke cleared, US Sailing team member Sarah Everhart-Skeels (Tiverton, RI), with crew JoAnn Stenk (White Plains, NY), was third. In second was Team Paradise’s Tracy Schmitt (Toronto, ON) sailing with Siobhan Murphy (Yonkers, NY). Last year, Judy Kowaleski, who traveled from San Diego,CA, announced that the Robie Women’s brought her the first bullet of her career. This year, sailing with Karrell Reginer (Gatineau, QC), she scored three firsts and a second to win by five points. At the One-Design Regatta’s competitors meeting Friday morning, the sailors received a surprise guest, America’s Cup Hall of Fame member and the designer of the Ideal 18, Bruce Kirby of Rowayton, CT. Bruce was clearly proud of the joy his design is bringing to so many sailors with disabilities. Good conditions held all day Friday, with four competitive races held. Unfortunately the wind gods got a little overanxious the next day. With morning winds of 12-18 knots and gusts to 26, racing was postponed; but never let it be said that sailors waste time. A competitive game of bocce was quickly organized and a number of sailors participated. Try playing this sport with your eyes closed if you want a challenge. The winds finally abated around noon but then died, yielding only two more races. The highlight of Saturday night’s party was the appearance of the Regattas’ namesake, Robie Pierce of Newport, RI. Robie commented that he was happy to see so many new faces, as the Robie is all about introducing new sailors to the sport. After a delicious dinner, the crowd was treated to some great bluegrass music by Homegrown, led by banjo player and event Co-Chair Buttons Padin. Sunday was once again light and variable, but the RC was able to squeeze out a seventh race before going ashore for prizes. In fifth place was the Annapolis, MD pair of Lance Hinrichs and John Tarrant, winning a tiebreaker with Rusty Sargent (Mystic, CT) and Charles McClure (Brookline, MA). In fourth was former LYC member Paul Garcia (Hyannis, MA) and Chris Livesay (Ft. Worth, TX). In third was Charlie Rosenberg (Woodstock, CT) with alternating crew Bill Blanchard (LYC’s Rear Commodore) and Nancy Jodoin (Boston, MA). For the second year in a row, the regatta finished in a two-way tie for first. In second were US Sailing Team member Gerry Tiernan (Falmouth, ME) from Sail Maine and Dennis Moran (Framingham, MA). While still suffering from his beloved Bruins’ loss in the Stanley Cup playoffs and the Red Sox 10-game losing streak, Hyannis Yacht Club’s Mike Hersey, sailing with 2008 Paralympic Gold Medalist Maureen McKinnon (Marblehead, MA), sailed away with the title. Mike was quick to credit his son Matt, who was their on-board able-bodied sailor (AB). As always, this regatta could never have happened without the support of so many generous sponsors including Heineken USA, Mercedes-Benz of New Rochelle, Green Mountain Coffee Roasters, Lucerne Capital Management, LLC, and Magnum Bars. New sponsors this year were the Burke Rehabilitation Center, UK Sailmakers, and area realtor Houlihan Lawrence. In addition, the Bob Woodruff Foundation stepped up to provide travel funding for the wounded veterans who sailed in the regatta. Complete results can be found at larchmontyc.org/Yachting/Regatta_Schedule/Robie-Pierce-Regatta.aspx, and a video by LYC member Maureen Koeppel can be found on YouTube. The next Robie Pierce Regattas will be held at American YC May 28-31, 2015.